Friday 3:30 – 7 pm & Saturday 10 am-2 pm. RBA starts children at age two in Tiny Tots. Creative Movement is offered at age four; this experience is designed to bring out the creative aspects in the child’s nature and to provide a learning experience based on sound technique. Children learn coordination, rhythm, music, spatial awareness and are encouraged to use their imagination. 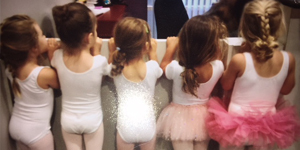 Pre-Ballet is offered for children age five. Boys and girls learn the positions of their feet and arms, proper body placement and beginning music and storylines of the classical ballets and refine the concepts taught in Creative Movement. 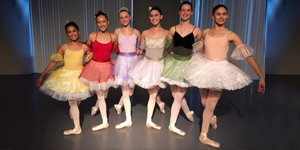 The Pre-Professional Ballet program begins for age’s six to twelve, with two or more classes per week. 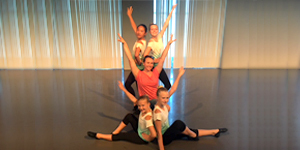 This program is designed for both the career-bound dancer and the dancer who desires to learn ballet as an art form and for body control and strength. 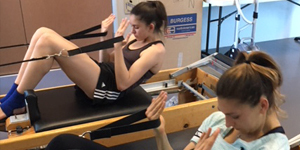 The Pre-Professional program emphasizes individual and precise training with special consideration for the young body. Pre-Pointe and Pointe classes are offered to youth and adult dancers to complement the student’s technique classes. Separate classes for men and boys are taught to provide the training essential to meeting the demands specific to the male dancer. Adults and teens interested in learning ballet as an art form and for exercise, strength and flexibility may take advanced level classes provided they are at a level concurrent with the other student. RBA’S Professional Program is for male and female dancers thirteen and older. The dancers must be focused and oriented toward a professional career. 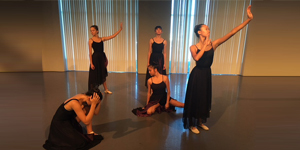 Professional Program students qualify for many of the State of California sanctioned Independent Study program, which recognizes the dancer’s ballet course, work in place of the Physical Education requirements for middle and high school. RBA recognizes many Charter Schools and Home School Programs and many of our classes are in session in the early afternoon hours providing more dance instruction during the day for our Professional Program students. The Professional Ballet Program, designed for the career-bound dancer takes students through a syllabus consisting of seven levels. Students are trained with the most current techniques and a commitment to the individual’s growth and progress. Placement classes are offered to dancers with previous ballet training who wish to enroll at RBA. Upon review, the school director or faculty member. Contemporary dance tends to combine the strong but controlled legwork of ballet and modern, concentrating on torso and upper body. It also employs contract-release, floor work, fall and recovery, and improvisation characteristics of modern dance. Unpredictable changes in rhythm, speed, and direction are often used, as well. Additionally, contemporary dance sometimes incorporates elements of non-western dance cultures, such as elements from African dance including bent knees, or movements from the Japanese contemporary dance. Jazz classes incorporate several dance related dance styles. All of them are connected via common roots, namely tap, ballet, jazz music, and African-American rhythms and dance. Jazz dance originated from the African American vernacular dance of the late 1800s to the mid-1900s. 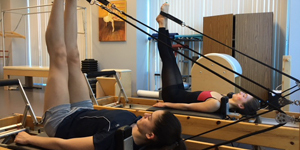 Certified guest instructors offer Pilates classes monthly. These classes utilize the theories and methods of orthopedic surgeons, physiatrists, and physical therapists within the field of Arts Medicine and Kinesiology. Unique to the region, Movement for Life -BRAVA (offered at the RBA Studios) is the only program in the Inland Empire that provides instruction to Parkinson’s disease (PD) and Multiple Sclerosis (MS) patients using directed motion through dance to improve their condition. 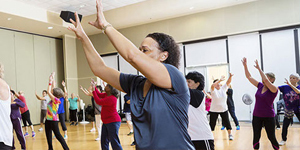 This program successfully uses the Dance for PD® model to dramatically increase the quality of life of these patients in direct coordination with their treating physician. Exercise and a wide variety of Body Conditioning and Training classes are an excellent way of staying healthy and in top shape. Riverside Ballet Arts offers a diverse number of classes for body strength and physical training. Known internationally for our excellence Ballet training, RBA offers adult and teen classes for physical training, coordination, strength and body control. Adult ballet is a fun way to stay connected to an art form we may have participated in, excelled in, or always wished to learn as a child.